Manchester United striker Romelu Lukaku is to seek legal advice over claims made by Everton owner Farhad Moshiri that he opted to leave the club after receiving a "voodoo message". Moshiri told a shareholders' meeting that Lukaku, 24, received the message from "a pilgrimage to Africa". Lukaku joined United for £75m in July after rejecting a new deal at Everton. A representative for the player told BBC Sport: "Romelu's decision had nothing to do with voodoo." The spokesperson added: "He distances himself from these beliefs and this statement and will now see what judicial steps can be taken in relation to them." BBC Sport understands the Belgian has been left upset and angry by the claims. 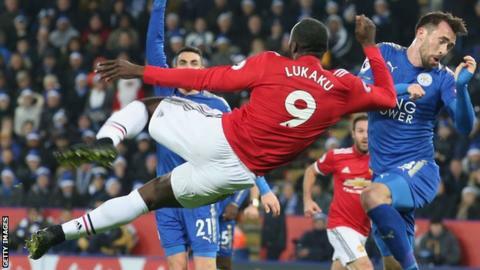 His representative says Lukaku rejected the opportunity to become the highest paid player in Everton's history in order to pursue his desire to play at the highest possible level. His representative added: "Romelu is very catholic and voodoo is not part of his life or his beliefs. "He simply had no faith in Everton and no confidence in Mr Moshiri's project. That is why he did not want to sign on any condition. "He wanted to make the next step in his career and wanted the security to be able to leave." Last March Lukaku's agent, Mino Raiola, had claimed a new deal to remain at Everton was "99.9% done". Premier League champions Chelsea had bid for Lukaku, but he then opted instead to join Jose Mourinho's United. "We offered him a better deal than Chelsea and his agent came to Finch Farm to sign the contract," Moshiri told Everton's annual general meeting. "Robert [Elstone, chief executive] was there, everything was in place, there were a few reporters outside," he added. Moshiri said Lukaku then "called his mother" before the player revealed he had received the message telling him to join Chelsea. The Iranian billionaire, who has put £150m of his own money into the Merseyside club to clear debts, said the Toffees offered the striker an "unbelievable" amount of money to stay and the "issue was not financial". Moshiri added: "I wasted two summers to keep him. First summer with his agent, him and his family we managed to keep him. Last summer we offered him a better deal than Chelsea - whatever they offered we matched but he just didn't want to stay." It is understood he rejected numerous opportunities to discuss a new contract as his desire to leave Everton was absolute. He then rebuffed further attempts to keep him at the end of last season. Twelve months previously Everton rejected offers from Lukaku's former club Chelsea to re-sign the player.